Here is a sample screenplay treatment written by AKINTILO SAMUEL, and the original script is for sale. A determined but uncompromising young woman whose dream is to find a good husband and raise a family is faced with the challenges of marriage after her husband’s health depreciates and her in-laws turn her life into a living hell. TINUKE’S marriage becomes sour when her husband AKIN’s health starts deteriorating, IYA AKIN, AKIN’S mother makes life miserable for TINUKE together with BASIRA, AKIN’S younger sister because IYA AKIN doesn’t want AKIN to get married. Things get really tensed after TINUKE loses her child and it is discovered that AKIN’S ill-health is spiritually manipulated and his mother may be behind it. Late 70s. TINUKE is still suffering from the bitter disappointment of having to let go of her true love ADEKUNLE due to a decision she finds really hard to understand when AKIN meets her. AKIN is visiting his friend MR IBIRONKE who is a senior colleague to Tinuke at work, AKIN develops an interest in TINUKE after hearing glowing remarks about her from his friend. TINUKE rejects every advance AKIN makes. But AKIN is keen and after some weeks, TINUKE softens her stance and their love affair starts. Few days after TINUKE gives birth to her first child, IYA AKIN (AKIN’S MOTHER) invites her to her house and what she tells TINUKE surprises her and at the same time frightens her. AKIN’S suddenly starts to fall sick and he’s in and out of the hospital. Even though TINUKE is peacefully and quietly going about her marriage, her mother in-law and BASIRA (AKIN’S SISTER) sees her as a threat to their plans and plot to kill her. TINUKE being a devoted Christian turn to prayer but she is not able to prevent her daughter from dying. Some years pass and AKIN’S health keep deteriorating and AKIN’s family accuses TINUKE that she’s behind her husband’s ill health. TINUKE’S marriage is now full of sorrow and pain but she is determined not to lose her husband. This particular script is about 75 pages, the scenes are about 62 scenes divided in 5 ACTS, the script is formatted in courier font style, with page numbering at the right top corner, with characters title at the center of their dialogues, font size (12). An old big house for an extended family setting will be needed. A office setting with 2 tables and 2 typewriters is required. A crowd of like 15 is required. 3 different church settings where one in particular with like 9 prayer warriors and another with mission house is required. Cars and 1 bus will be needed. An hospital room with 3 beds. BASIRA: A mean woman who cares only about her interest, a stack illiterate, married to an old man…..
ADEKUNLE, SARAH, AKEEM, TAJU, BROTHER ADE, SUNDAY, OLUSHO, MAMA DAYCARE. NOTE: Your treatment can be up to 2, 3 or more pages depending on the length of your script. And you have to give in your best in order to impress the reader (the potential buyer). 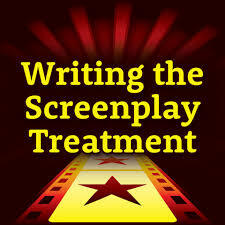 The better your treatment, the greater your chance of selling your script. And Just don't be afraid! It may not be easy for someone to copy the content in your script after they read your logline/synopsis/treatment. Art is so dynamic, and even if anyone developed a story from your logline/synopsis/treatment, it can never be the same with what you have originally. Every art is very unique, and no two arts can ever be the same even if they were from same source.